I first sampled this ink a long time ago back in the beginning of my foray into fountain pens and ink. 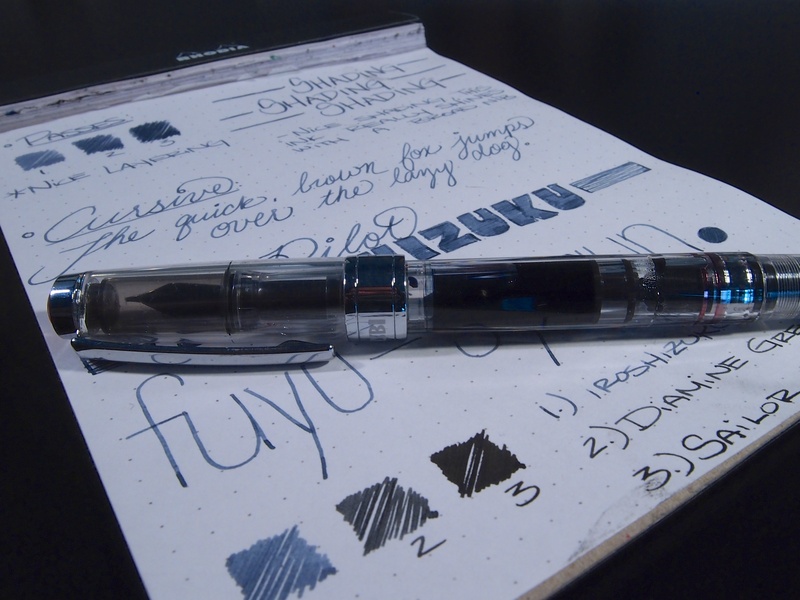 I was in the market for a grey ink, and I was immediately drawn to the blue-grey of the Fuyu-Syogun. I’ve gone through three samples of this ink and have enjoyed them quite a bit, but I never caved in and bought a bottle. This past Christmas I was lucky enough to receive a bottle as a gift from my girlfriend, who had no idea that I had already loved the ink. It’s a great shade of blue-grey with nice shading properties, great performance, and nice flow. Every singe one of the inks in the Iroshizuku line that I’ve tried were very well behaved and cleaned out easily. Pilot really knew what they were doing when they made the Iroshizuku line of inks.  I would highly recommend checking one of them out. I think there are enough colors to make anyone happy and the ink is an absolute pleasure a write with. Very nice! This has been my fav. ink and colors for the last 8+ months. Thanks! I think fuyu-syogun is my current favorite too. I just put it in my medium nib Lamy 2000 and it’s so buttery smooth. The medium is wide and wet enough to take advantage of the nice shading properties too. I tried a sample of this a year ago but in my inexperience, back then, didn’t use it in a wet enough nib and so disregarded it. I did re-test a small amount of the remaining test vial in a vintage flex and loved the shading. 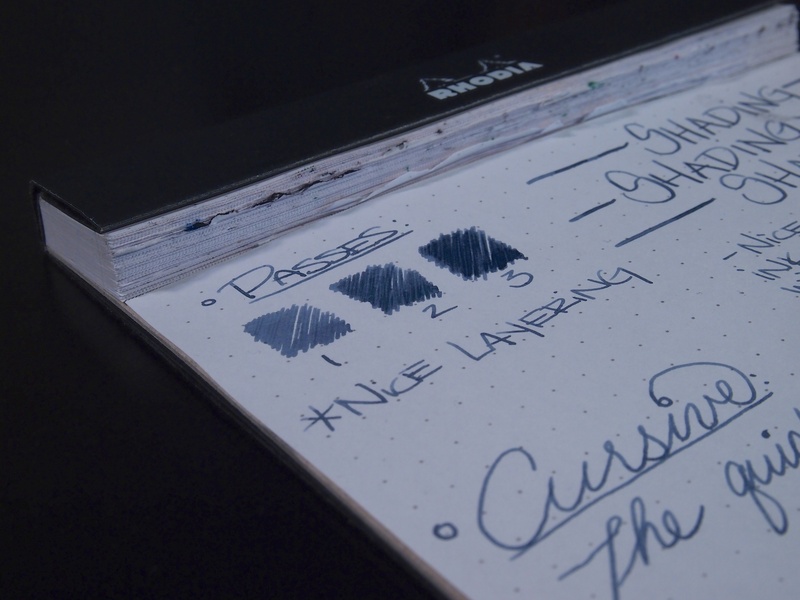 Think this one is next on my list from the Iroshizuku line – currently awaiting Kon-Peki and Shin-Kai in the mail as I type. Nice! I also have a bottle of the Kon-Peki and I love it. I’ve also tried Kiri-Same and Yu-Yake, those are both great as well. I have a sample of the Take-Sumi waiting for a pen to be freed up, looking forward to trying it out. Lovely colour. Looks sorta grey-blue, quite nice. And of course, fabulous review as always! 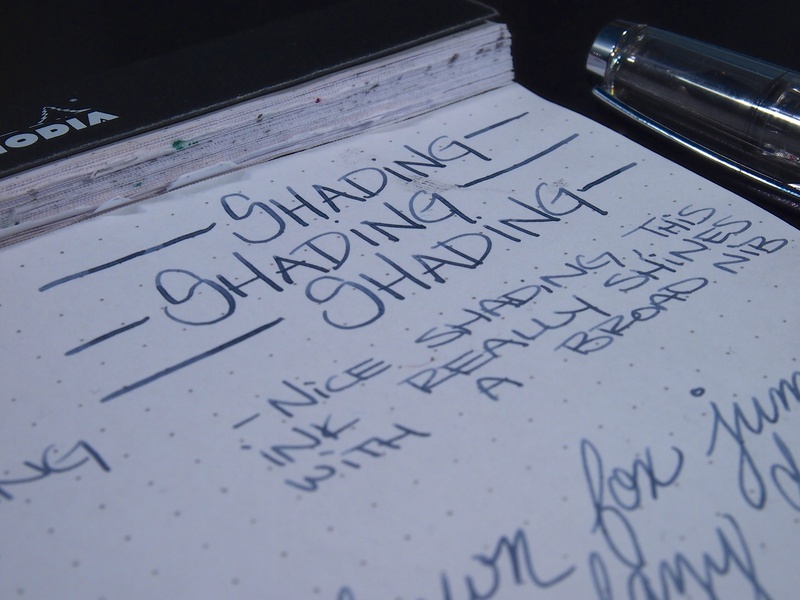 I must try this out in a flex pen to see that shading! Thank you, as always! It definitely leans towards a blue-grey, I think my pictures may have it look more blue than usual though. 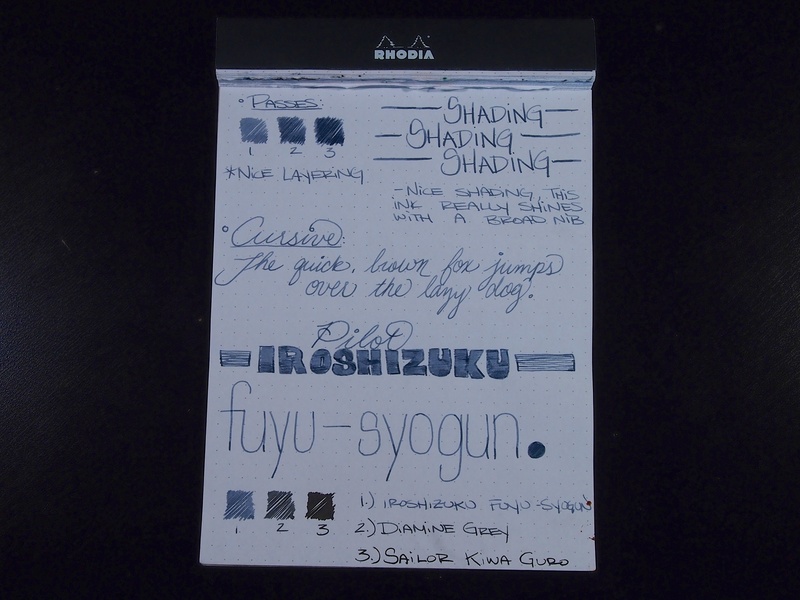 The other grey in the Iroshizuku line is kiri-same, which is much more of a true grey, but the reason I like this one so much is the fact that it’s a unique color. Definitely try it out in a flex, it’ll be great! Thanks! It’s one of my favorites, glad I finally got a bottle. It’s definitely one of my favorites. 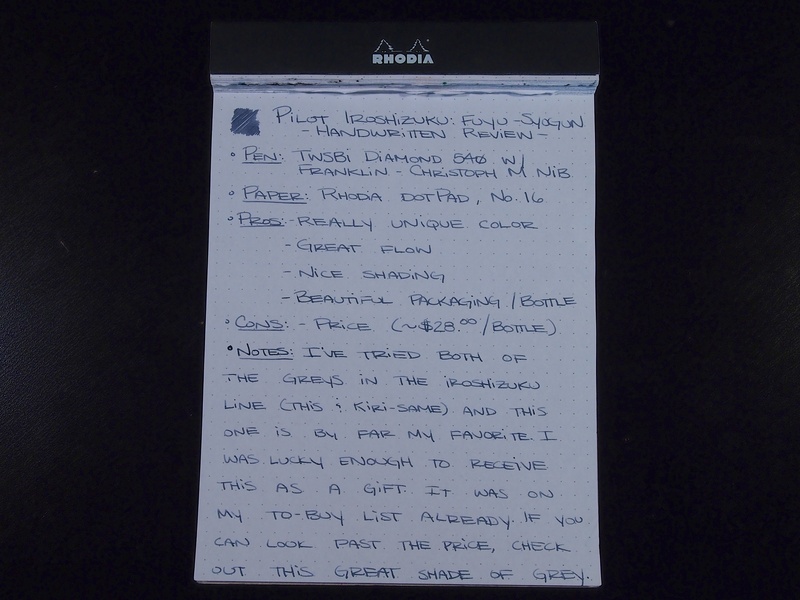 I recently tried a sample of the kiri-same and found it pretty close to my Diamine Grey. I like the slight blue tint that the fuyu-syogun has, it really sets the ink apart from regular greys. Nice review. This ink is so lovely. To be honest though, I prefer Kiri-Same, but they´re both lovely greys. Thank you! While I like Kiri-same, I think it’s a bit plain. 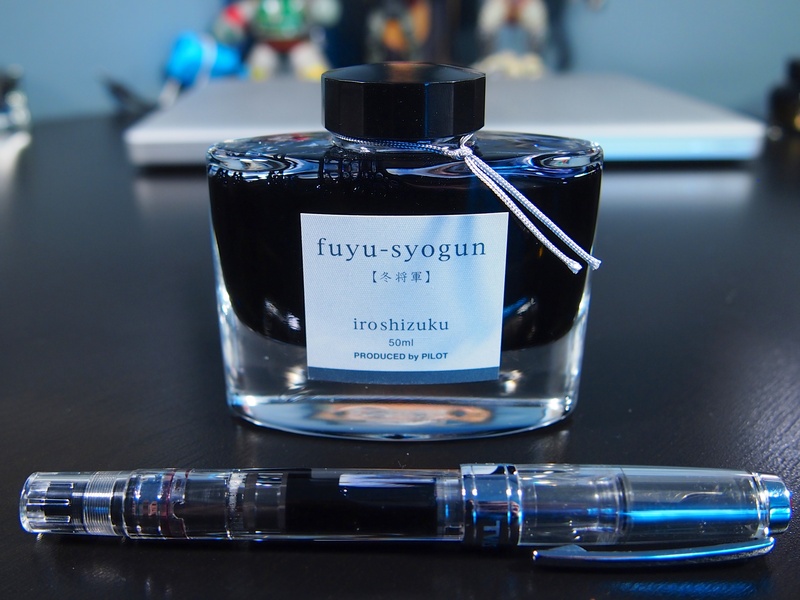 I really like the blue tinge to the fuyu-syogun, it makes the ink more special. I think the kiri-same is better for everyday writing though.